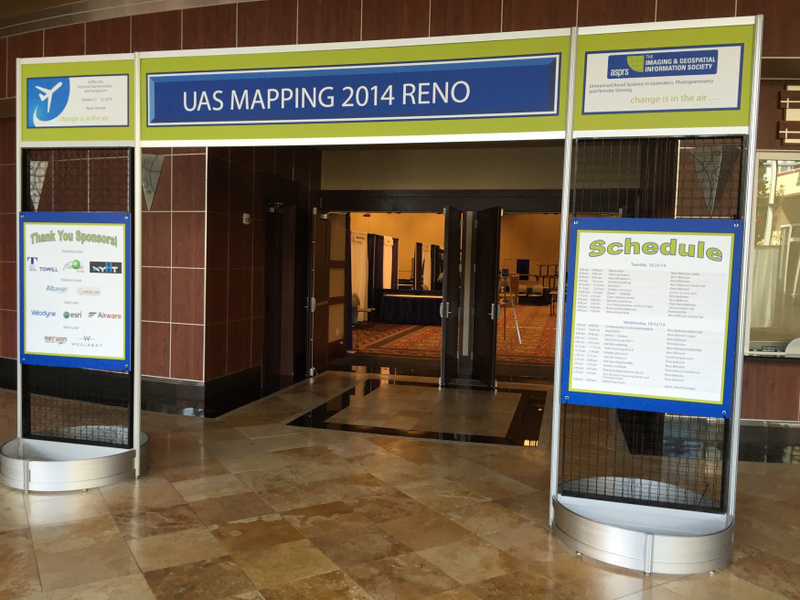 The inaugural ASPRS UAS Conference was held October 20-22 in Reno, Nevada, bringing together a diverse group of technologists, pilots, surveyors, vendors and consultants to talk about this emerging technology. 500 attendees and 50 exhibitors were in attendance. Master of Ceremonies, Lewis Graham of GeoCue, opened with his comments on the importance of miniaturization, connectivity and sensors in the UAS market. 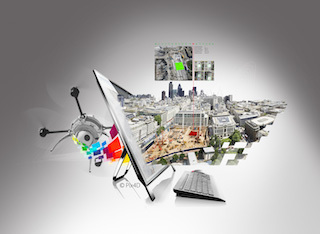 The confluence of miniaturization, guidance and control systems, motors, sensors, on the photogrammetry side, new technologies out of robotic vision, taking point clouds of photos and taking information from this all conspire to bring UAS to the forefront and make it a force to be reckoned with. The drone industry is coming to Nevada, said US Representative for Congress Ken Brooke who works for Rep. Mark Amodei. With a video appearance from the mayor of Reno and appearances from other statesmen, it was clear that the UAS or drone industry is a political topic. According to Brooke, Washington “doesn’t know much about drones,” but they know it’s a booming industry. It is also an industry that promises to turn many existing industries upside down and inside out. Gravel companies, for example, can do measuring with UAS. What does this do to conventional mapping and surveyors? There are total stations, RTK and UAS that can do the same job now. We can fuse data to make 3D/4D/nD maps and create new models that insinuate new ways to map the earth. We can see how changes occur, can building models of our cities that have interiors as well. Dr. Steward Walker, President ASPRS who is also at BA Systems, spoke about the evolution of ASPRS, now in its 80th year. This conference was arranged by the Northern California Regional Chapter of ASPRS. The organization is going through the process of setting up a UAS division, just as they did with LiDAR a few years ago. They should be ratified at the annual conference in Denver in a few months, he said. There may be a need for certification in the area of UAS just as there is for the use of LiDAR. Along those lines, Pierre le Roux, a model airplane flyer, said that there are risks in this phase of UAS at the moment but that through ASPRS and other support systems, the community can get authoritative guidance to help mitigate the risk. Further, Nevada is the first state to buy large netting systems, that allows you to put your GPS signals out. In southern Nevada people can get a range within a week to fly. In the afternoon, attendees were bussed out to the test site to see the performance of various UAVs. Vikki Stone, POMS & Associates, talked next about insurance, which is what her firm offers to the UAS industry. “Insurance companies are underwriting UAVs and particularly UAV operators, looking at your experience and what your machine is going to do,” said Stone. Attorney Cameron Cloar, Nixon Peabody, said that UAVs are really disrupting the legal industry. Stewart Baillie of Unmanned Systems Canada confirmed that in their country they understand how unmanned aircraft need to be regulated. They have been flying legal operations since the 1990s. Aerial robotics are reaching out from information networks to the physical world. Now with an iPhone, you can have an information service delivered to you – something from Amazon or pharmaceuticals. It can be delivered on an aero-robotics network and you’ll receive it in half an hour. “It is the physical manifestation of the internet, and presents a complex problem,” said Evans. He predicts that aerial robotics will be as common to our infrastructure as the smartphone. This is a good metaphor for the visual and regulatory acuity of the FAA. “It’s a yellow pool of light – that you recognize from the air, you recognize cities that way,” Evans pointed out. A map is a metaphor for the rules. Digital air charts bring in current rules that bring jets down from the sky. If we can add the aero-robotics networks and rules acuity we need in the city. Evans showed a network of pharmacies that he brought to the Portland urban planning development,that also includes route optimizations for integrating robotics into the city. He outlined other rules that could occur, starting with an enterprise flight management system where owners can register their own vehicle, the equivalent of having a pilots’ license and map address. “We’re changing this into a digital architecture, and packets of sensors will move around in the real world, with little fear of colliding as package of data on the internet,” Evans said. Aerial Robotics Network wants to create safe air corridors and route management. Skyward.io workflow streamlines the process of obtaining the proper certificates, waivers and other paperwork required. AirVu is an enterprise flight management system in a digital architecture. Using an iPad in the field, you can log that flight, and charge for it. The Dronecode Foundation has led the charge on building a coalition at the code level in an Open Source environment. This entry was posted on Monday, November 3rd, 2014 at 4:42 pm. You can follow any responses to this entry through the RSS 2.0 feed. You can leave a response, or trackback from your own site. We at Transition Habitat conservancy plan to introduce drones to monitor over 6000 acres of land we own and manage. Is there any app that can import parcel layers to plan flight paths?